This spring we had the opportunity to redeem airline miles for a trip to the Seychelles, Mauritius, and Paris. A once in a lifetime opportunity. It was all possible by effective use of stopovers and open jaws. Let me provide a detailed example how we used both the stopover and the open jaw with the SkyTeam alliance. It was difficult to decide where to celebrate the special ocassion, but we had narrowed it down to the Seychelles or Paris. Then we thought, why not go to both? The flight to the Seychelles was going to be very long so we thought it would be great to explore an island near the Seychelles, then on the way home stop over in Paris. We settled on an itenerary that would take us through Paris to the Seychelles Islands, then by using an open jaw we’d go to Mauritius. On our return we would fly out of Mauritius to Paris and stay there for 5 nights. Then return back to Tampa by flying through Atlanta. 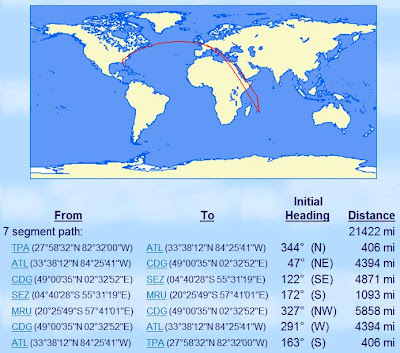 Once we settled on our destinations and routings we searched the SkyTeam network for available flights and came up with the following itenerary. A Delta award ticket to Europe in Business Elite would have been 100,000 Delta SkyMiles by itself, and a Business Elite ticket to Africa would have been 120,000 SkyMiles by itself. Since I acomplished visiting Paris through the use of a stop over, and visited Mauritius & Seychelles using an open jaw, the ticket only priced out at 120,000 skymiles per person. This was a fairly complex award ticket to book. I used NWA’s Japan award availability tool to find the SkyTeam availability on each flight separately. Then I called the Platinum award desk to work with the agent to find the availability and put the award together, well worth the $25 over the phone booking fee. When we issued the award tickets each flight was selling for a little over $9,000. I achieved a point value $.075 cents per mile ($9,000/120,000 miles = .075). Pretty good value for 240,000 SkyMiles. The only drawback was that Air Seychelles doesn’t issue electronic tickets. Our entire itenerary was issued as paper tickets which made us a little uncomfortable carrying around over $18,000 worth of airline tickets throughout our trip. Using the Stopover and/or OpenJaw can significantly increase the value of your award ticket and make your vacation more enjoyable by being able to visit multiple places in proximity to your destination. Each carrier has their own rules about these types of tickets so check into your carrier of choice prior to booking. If you have any questions about your next booking email me and I’d be happy to try to help. So well and nice posting , I like it. Mauritius is indeed the country of diversity par excellence. It is an excellent reason to honeymoon to this exceptional country offering extremely attractive natural spaces. I WANT TO KNOW IF YOU CAN MAKE AIRLINE RESERVATION FOR TWO OF OUR CORAL SPORT MEMBER TRAVEL FROM GHANA ACCRA TO SEYCHELLES AND I WANT YOU TO MAKE THE RESERVATION ON EMIRATE AIRLINE FOR TWO OF THEM AND GIVE ME THE PRICE PER EACH PERSON IF YOU WANT TO DICUSS WITH ME YOU CAN CALL ME ON +12018829619 THIS IS THE NAME OF THE TRAVELERS. Melinda, I hope you were able to find the booking you were looking for.